Readers may recall that, in the first edition of CASCADE in 1999, there was an article entitled "Silence of the Lambs?" 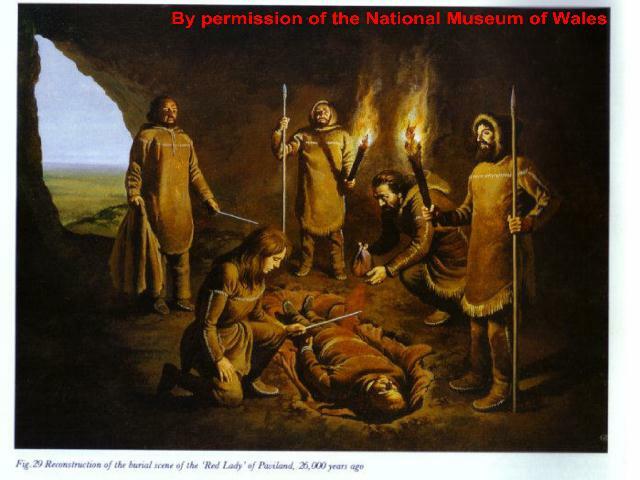 which described an experiment we did to test the hypothesis that covering corpses in red ochre may deter scavengers. Alf Webb had suffered an unfortunate experience in the Kalahari during the last war which led him to believe that, as well as having a decorative and religious use, red ochre was used by present day hunter-gatherers as a means of protecting their buried fellows from being dug up and eaten. If so, perhaps our ancestors also knew this trick, an idea of some significance to archaeologists and palaeo-anthropologists. 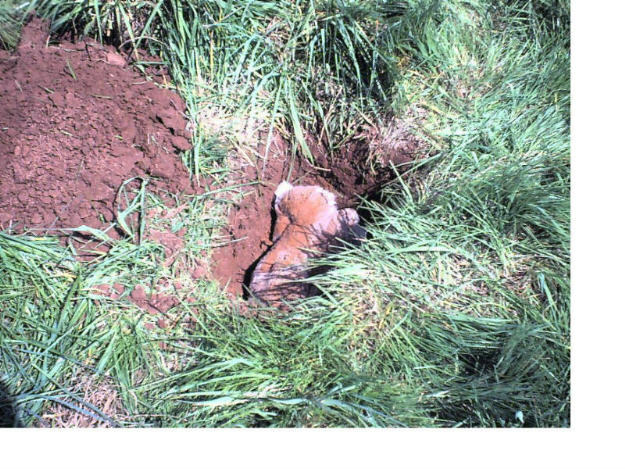 On 25 April 1999, in a field to the south of Shirenewton village, two lambs were buried in shallow graves near to a hole in a hedge which was known to be used by foxes. 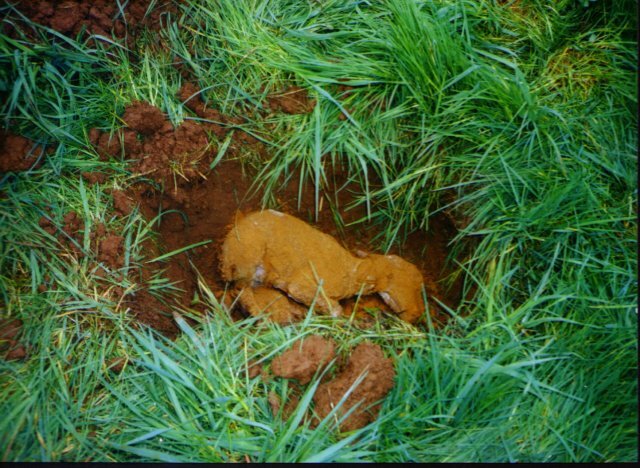 One of the lambs was completely covered with red ochre on its upper surface before being covered by soil. 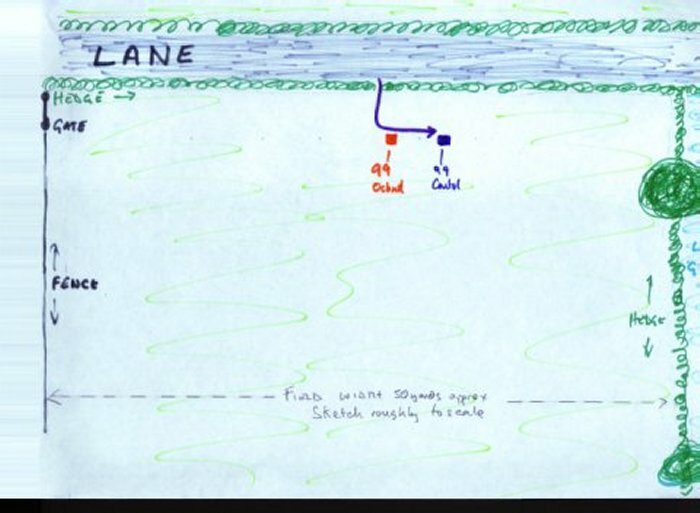 There is a diagram on the website which shows the position of the two graves and of the fox run. 44 days after the interment, the "control" grave (ie the one with no red ochre) had been raided and the body partly exhumed. The corpse was re-covered. Three days later - and on a further five occasions! - a fox (or foxes) returned to the grave until, some 58 days after the original burials the lamb had completely disappeared. Significantly, the path of the fox took it past the grave of the lamb which had been covered in ochre but this grave showed no sign of disturbance. 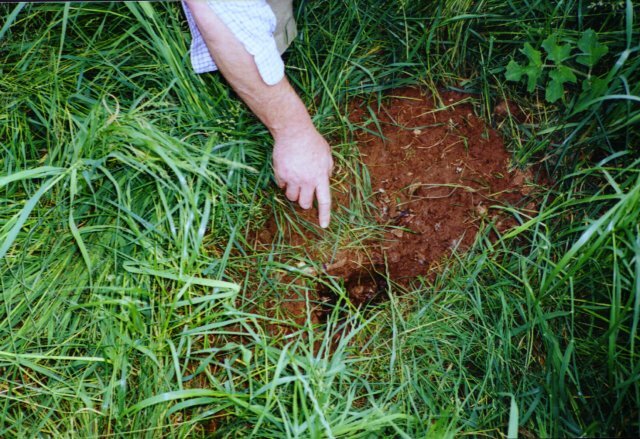 However, on 25 June, some 61 days after the burials, this "ochred" grave was attacked, with two separate holes dug but with the corpse apparently untouched. The holes were covered and no further signs of a visit were seen. 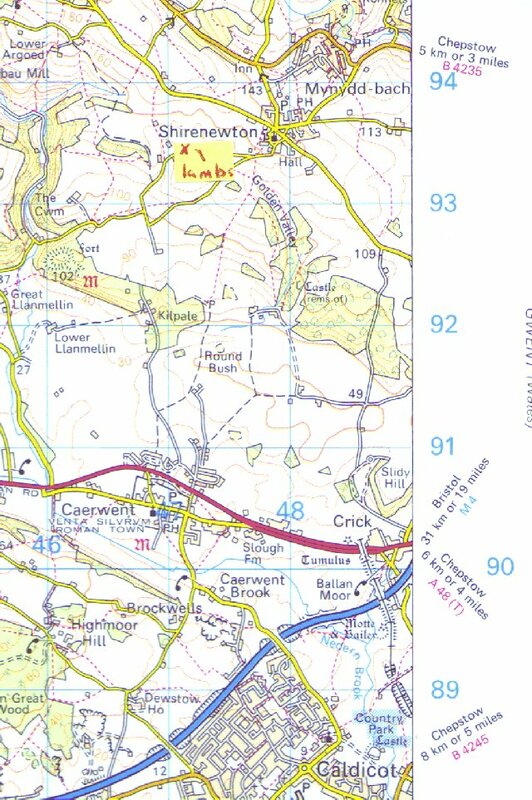 On 1 May 2000, the grave was examined by Alf Webb and myself. To our delight, the entire skeleton of a lamb seemed to be in the ground, more than a year after it had been buried and more than ten months after it had been disturbed on a solitary occasion. Felicity Taylor later examined the bones and confirmed that no part of the lamb seemed to be missing. A secondary objective of the experiment was to ascertain how long it took before the bones were stained red. The result was inconclusive. The bones were brownish but the natural colour of the soil in this area is a reddish brown anyway. It seemed that the corpse had not been in the ground long enough. However, the main objective had been achieved - it seemed that red ochre might act as a deterrent! 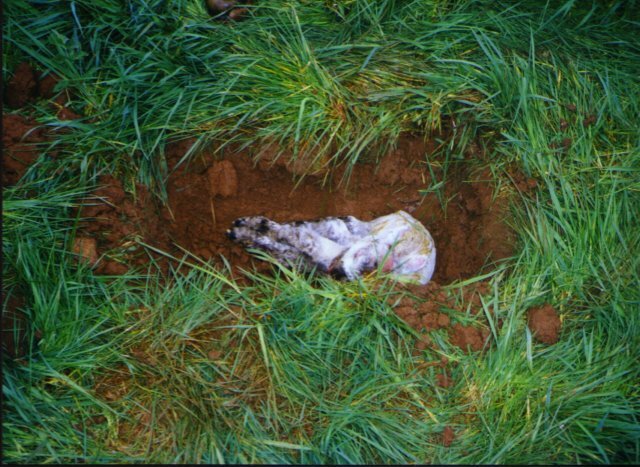 We decided to repeat the experiment with more lamb corpses in 2000. With just 2 corpses, one ochred and the other as a "control", there is a 50% chance that the scavenger will choose the control corpse at random. With five corpse, three of which are "controls", there is only a 10% chance that the three control corpse will be chosen, one after the other, rather than the 2 ochred corpses. 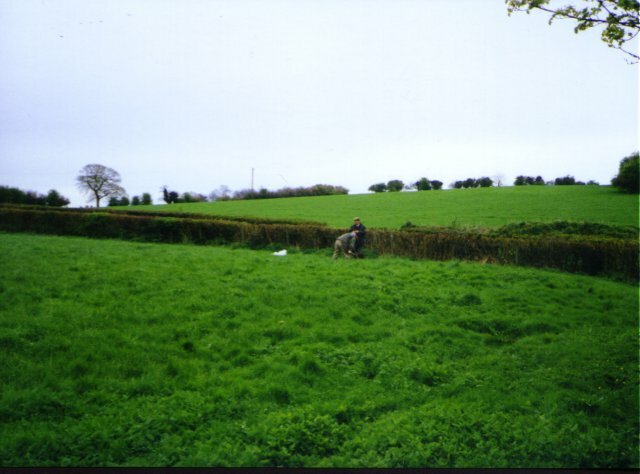 Thus, five lamb corpses were buried on 1 May 2000, two of them being sprinkled with ochre. The positions of the corpses are also shown on the website diagram. The results were not what we had hoped!. The first grave raided, sometime between the 15th and 19th of May, contained one of the ochred corpses. The next three raided were the three "control" graves and finally the other ochred grave was robbed. All of this happened quickly - the five lambs had gone within 33 days of being buried! Thus on the face of things, it would seem that this second experiment disproved the hypothesis. The scavenger(s) attacked the graves in a random fashion apparently disproving that red ochre acts as a deterrent. 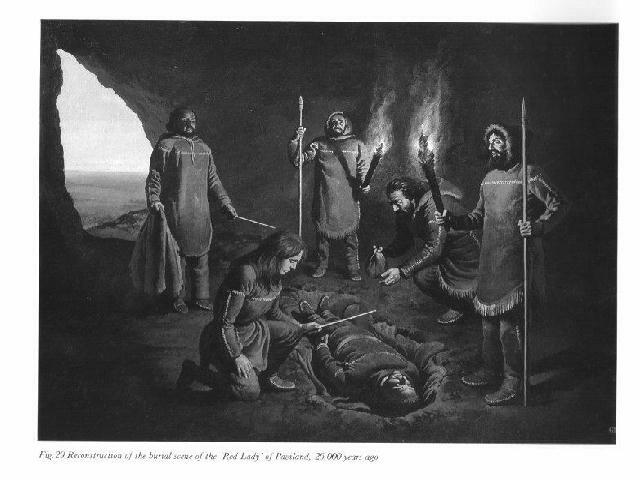 But the first experiment, despite the fact that there were only two corpses, suggested that the ochre had an effect. Furthermore, there were some important differences in the way in which the two experiments were carried out. Before examining these, it is worth considering what the causal link might be - why should scattering red ochre be a deterrent to scavengers? The internet was used to try to answer this question and a variety of possibilities were put forward by scientists, archaeologists and anthropologists from around the world - taste, texture, smell and so on. But perhaps the most interesting suggestion came from the BBC Radio4 series "Origins" (Part III, Feb 2000) in which it was stated that red ochre is used on the human skin by modern day hunter gatherers as an anti-bacteriological agent. Since bacteria are involved in the decay of corpses, perhaps this is the answer? 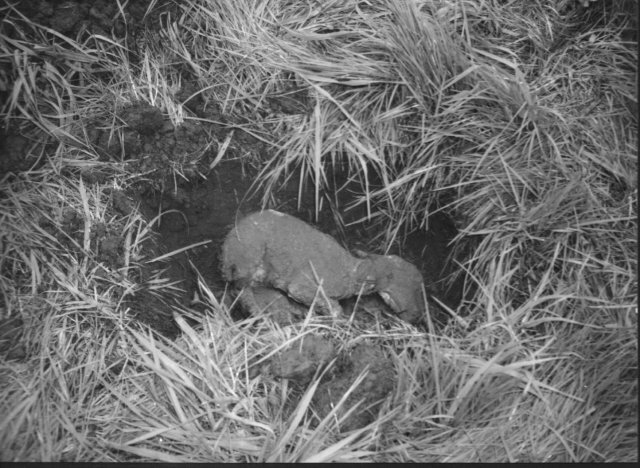 This photo shows clearly that the lamb in the first experiment was thoroughly covered. There were a number of things that went wrong compared to the first experiment, but, if the anti-bacteriological properties of red ochre are the key factor, then three problems may explain the "failure" of the second experiment. Firstly, the lambs were de-frosted for 40 hours before interment (and we did not know how long most of them had been dead before freezing) - Lyn wanted her freezer back and Doug Gentles had transport problems. This is one of the two lambs in the second experiment. The photo shows that the ochre cover is patchy (more clearly seen in colour photos on the web site). The second ochred lamb was even more patchily covered. Secondly there was a shortfall in the amount of ochre available - about the same quantity used in the first experiment now had to cover two lambs instead of one. Thirdly, the raids happened within between two and three weeks of burial (vs. over six weeks in the first experiment) and no one was on hand to re-inter the raided corpse. Taken together, one interpretation of the second experiment is that the lambs had started to decompose too much before burial and/or the amount of ochre used was insufficient to alter the decomposition process. It is probably not worth repeating the experiment until further research has been done on the anti-bacteriological aspect. The two experiments were useful - even though the second one seemed to "fail", an analysis of the reasons why it might have produced different results from the first one has perhaps produced an interesting hypothesis. We have identified a number of shortcomings in the methodology which are detailed in the full write-up (which is on the web site). An attempt will be made to interest other researchers in conducting more rigorous experiments with greater resources than were at our disposal. One thing is clear - the site is a popular venue for grave robbers! Full details of the experiments are available on the internet at redochre.thecayo.com.